This would make a lovely dish for a dinner party on a summer’s evening. 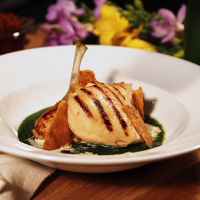 The coulis can be made in advance so only the chicken needs to be cooked once your guests have arrived. 1. Season the chicken and rub with oil. Place on a griddle pan over a medium heat until thoroughly cooked, the juices run clear and there is no pink meat. 2. Trim the stalks from the watercress, slice the potato paper thin. 3. Heat a wide pan over a high heat with a little oil, sweat the potatoes and watercress, until wilted then add enough boiling water to cover. 4. Bring quickly to the boil, by now the potato should be cooked. Remove from the heat, season and blend the contents of the pan. 5. Pass through a sieve into a bowl over ice to keep the coulis vibrant green. 6. Serve warm in a bowl plate with the cooked chicken, a drizzle of cream, a dusting of paprika and the tomato chutney (click to view recipe).